Our Abpromise guarantee covers the use of ab22396 in the following tested applications. Flow Cytometry - Anti-Matrix protein 1 antibody [GA2B] (ab22396)Image courtesy of an anonymous Abreview. ab22396 used in Flow Cytometry. 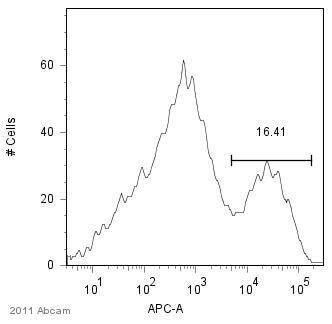 Influenza infected A549 cells were trypsinized, fixed in paraformaldehyde, permeabilized and then incubated with ab22396 for analysis by Flow Cytometry. ab22396 used at a 1/200 dilution. The secondary used was ab96874, diluted 1/200. Immunocytochemistry/ Immunofluorescence - Anti-Matrix protein 1 antibody [GA2B] (ab22396)Image from Chase GP et al., PLoS Pathog. 2011 Sep;7(9):e1002187. Epub 2011 Sep 1.Fig 4.; doi:10.1371/journal.ppat.1002187; September 1, 2011, PLoS Pathog 7(9): e1002187. Immunofluorescence analysis of HeLa cells staining Influenza A Virus M1 using ab22396. Cells were treated with either 20 µg/ml Prostaglandin A (PGA) or EtOH vehicle control, 3 hours post infection by Influenza A Virus, then fractionated at 9 hours post infection before analysis by immunofluorescence. Publishing research using ab22396? Please let us know so that we can cite the reference in this datasheet.